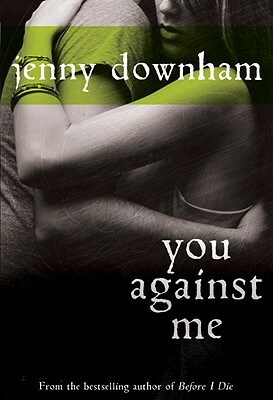 You Against Me by Jenny Downham. Grades 9+ David Fickling Books, September 2011. 416 pages. Reviewed from ARC snagged at ALA. When Mikey's sister is assaulted, he can't contain his anger. He watches Karen cowering in their flat, unable to face the world outside after she was raped and he seethes. He can't rest until he's avenged his family by beating this guy to a pulp. When Ellie's brother comes under attack, she stands by him. He's her perfect brother, the guy who's always protected her and looked out for her. She can't believe that these terrible accusations are true and she'll do anything she can to help him. When Mikey and Ellie meet, they each have ulterior motives. Get to know the enemy, find chinks and weaknesses in the case, get details that will help the lawyer... But soon other feelings start to grow and Mikey and Ellie will each have to decide where they stand and how much they're willing to sacrifice for what they believe and what they feel. This is an engrossing story about love, loyalty, and the shiftiness of truth. It's about finding out who your enemies are and then realizing that your definition of enemy is fluid and subject to change. It's about first love, that overpowering secret that lights you up from the inside. Once I started reading it, I couldn't put the book down. I have a brother and it made me think about my family and what I would do, what he would do, if any of these events happened to us. But this book is more than a sibling story and I appreciated that the story flowed seamlessly from sibling story to romance to courtroom drama. There's a lot happening, but it all works. I always tell people about my experience with Jenny Downham's first book Before I Die, a.k.a. The Book That Made Me Cry in the Middle of the Detroit Airport. It was one of those books that felt so real to me that I couldn't help but react to it. You Against Me is like that, too. Mikey and Ellie weren't just characters in a book; they became real to me. Part of that might be in the language of the book. You Against Me was originally published in England last year, and the British slang and terms remain. While I occasionally had to look up a word to make sure I knew what it was (spanner, for example), I felt like the language helped to create an immediate sense of place. I utterly believed in Mikey and Ellie's growing love. Their relationship developed steadily and realistically and it was a spot-on portrayal of first love. They both carry around these secret feelings, knowing that their families would freak out if they knew, making their relationship sizzle even while the writing's not graphic. Of course, a book dealing with this subject matter is not going to be appropriate for all teens. Although there's nothing super graphic, it does talk about the incident and there are instances of drug use. And one more thing: I just have to say that I dig the cover and LOVE the double meaning in the title. This was one of my favorite books of 2011, so please don't miss it! You Against Me is on shelves now.